According to Dr Caroline Leaf, communication pathologist and self-titled cognitive neuroscientist, multi-tasking is a myth. Actually, Dr Leaf isn’t completely wrong. Her factoid is so vague that there may be some truth in it somewhere. The problem with teaching via vague factoid is that no one can apply anything from it. If we were to take Dr Leaf’s statement as a specific teaching or advice, then we would be misled. Why? Because it all comes down to how you define ‘multi-tasking’. I have a couple of patients in a nursing home, two old ladies who sit on a balcony in the sun, knitting and talking at the same time. Isn’t that multi-tasking? Think of what you do every day. How often are you doing something menial while doing something requiring a bit more attention? How often do you have a conversation with your passenger while your driving? Isn’t that multi-tasking? When you get up in the morning and you are able to make a cup of tea and some breakfast at the same time, read some of the paper or your e-mails while you’re eating your breakfast at the same time, etc. Isn’t that multi-tasking? We multi-task all the time. If we had to do everything in a linear, sequential fashion, we would never get anything done. We are able to multi-task because routine tasks have become largely habitualised by our brains and don’t need lots of processing power to complete. Hence why we can do something as complex a driving a car while still talking to our passenger or listening to music. Certain occupations, such as air-traffic control, involve high levels of multi-tasking . When a task is new and/or complicated, our brains need to utilise our resources of attention to properly process the information required by the task. There is only so much that our working memory can handle. Our working memory uses tricks to handle larger amounts of information through a process called “chunking”  but there is still a finite limit. Performing two or more cognitively demanding tasks at the same time is difficult, and the brain can often cope by shifting tasks, although there is always a price to pay for this . So it is true that there are some tasks that require more of the cognitive capacity of the brain to process. The higher the cognitive load, the more capacity needed, and the less likely that the brain will be able to multi-task with it. Thus, it’s reasonable to suggest that we can’t multi-task all of the time with every task we have to perform (although the more we do a task, the more habitual it becomes, thus reducing the cognitive load of the task, and increasing our ability to multi-task it). However it’s misleading to say that we can’t multi-task at all. It’s a myth that multi-tasking is a myth. 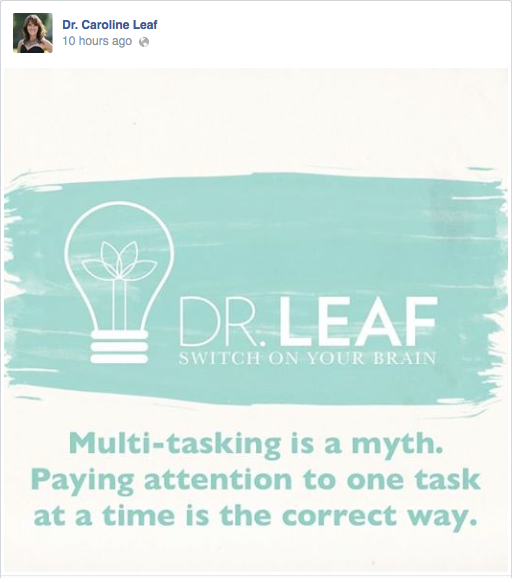 Dr Leaf’s comment that, “Paying attention to one task at a time is the correct way”, isn’t a summary of the neuroscience of attention, but a subjective statement based on her grandiose pretension. There is no objective evidence that “one task at a time” offers generally applicable benefit. So don’t be afraid of multi-tasking. Just know your limits. This entry was posted in Biological, Caroline Leaf, Psychological and tagged ADHD, attention, brain, caroline, caroline leaf, caroline leaf criticism, cerebral cortex, cognitive neuroscientist, criticism, dr caroline leaf, Dr Leaf, Facebook, Leaf, mind, multi-task, multi-tasking, myth, neurobiology, pseudoscience, task, tasking, toxic thought by cedwardpitt. Bookmark the permalink.